Suite 14/762 Toorak Road , Glen Iris, 3146. Place both in the box, seal box securely. Attach Mailing labels on top of the sealed box. Include images and shades where applicable. 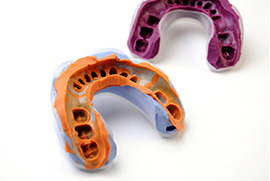 Use silicone instead of alginate at all times. Tip - It';s a good idea to use foam or bubble wrap around the Impression and Models to prevent damage during shipping and handling. Your case is now ready to be shipped !